Jamie Glenn/Daily Mining Gazette Dollar Bay’s Connor LeClaire turns to drive the ball up the court while be watched closely by Munising’s Anthony Mattson during a regional semifinal game Tuesday in Negaunee. 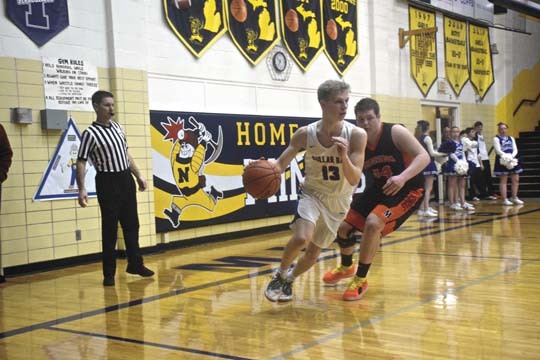 NEGAUNEE — If the Munising Mustangs wanted to end the Dollar Bay-Tamarack City Blue Bolts’ chances of making another run at a state title in the Division 4 Region 25 semifinals, those hopes were all but vanquished in the opening eight minutes of play. The Blue Bolts scored 23 points in the opening quarter and then continued to find ways to score afterwards to come away with 65-56 victory Tuesday in the Lakeview Memorial Gym. “I thought we put together nearly a complete game,” said Kentala. “That might’ve been the best we shot the ball all season, but we’re capable of that. We expect that of ourselves to be able to shoot the ball like that. Kentala felt that his Blue Bolts did a great job of hitting the shots they needed to throughout the night, but especially in the first half. Keeping Munising (15-5 overall) seniors Eli Werner and Anthony Mattson at bay was another key strategy for the Bolts going into the matchup. Anthony Mattson was held to five points and Werner put up 12. “We wanted to run those guys through screens,” Kentala said. “We wanted to dribble, drive the paint and have those guys look for our shooters. We knew we kind of had to have a shooting game and we did. Dollar Bay’s (19-4 overall) starting five all put up double figures. Ashton Janke, who actually had a bit of an off night, led the Bolts with 15 points, eight from inside to open the third quarter. Seniors Brenden LeClaire and Drake Schmitz held the Mustangs at Bay by alternating at the free throw line in the final minute of play. LeClaire put up 12 points overall and Schmitz 13. “These opportunities don’t come around often,” said Kentala. “I’ve been a part of sports for a long time. This is my third time here and I’m blessed and I know our guys are too. Munising found themselves with some slight momentum going into the second half with two three’s and nine inside buckets mostly coming from Werner, but the fact that the Blue Bolts played a bit of a different style from what they are used to got the best of the Mustangs. Jesse Matson lead the Orange and Black with 16 points overall, most coming in the opening frame of play. Mustangs coach Terry Kienitz was happy with how far his team made it despite facing adversity throughout the season. “Totally two different teams,” said Kienitz. “We’re bigger (and) a little bit stronger, they’re a little bit smaller (and) faster, so matchup-wise, it was (about) trying to take advantage of each other’s mismatches. Kienitz was pleased with Mattson’s strong night. “On our side, Jesse Mattson shot the ball well,” he said. “I think he was our leading scorer, so he kind of stepped up when we needed some buckets and kind of led the way for us. Despite the loss, Kienitz was happy with the way his team performed throughout the season. The Blue Bolts will face Crystal Falls Forest Park or Bessemer. They have not faced Crystal Falls yet this season but fell to Bessemer both times they saw the Speedboys, once in early December, 60-73, and once in mid-January, 65-57. Kentala sees this as a whole new game and is grateful for the unique opportunity.